What a beautiful image this picture paints! Today is a day to get into yourself, know what you want and test your own boundaries. I daresay from this yoga pose that you’ll be testing more than a few of your own boundaries you may be pushing yourself to breaking point. However, be aware that not everything happens all at once. One stretch lead to another… and another and before you know it you are where you set out to be. You have the capacity today to use all your resources both inner and outer and the beautiful array of colour in this card gives a glimpse to how you are using your resources. Each chakra is represented in this image so you have a great chance of tuning into yourself and balancing any aspect that you may have found to be coming up short lately. 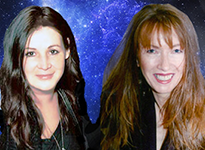 With Venus inconjunct Neptune today you may be looking to balance more about your love life and emotions than anything else. There may be the urge to merge with another person but you also need your own space and boundaries and if this has been a problem for you within a relationship recently then perhaps you may wish to gaze upon this image and hear what it speaks to you. The very fact that the person in this image is shown in the colour green suggests healing in some form is taking place alongside a groundedness you may never knew you possessed. Use it well and rather than exploring another person’s issues today… take a few precious hours to explore your own. 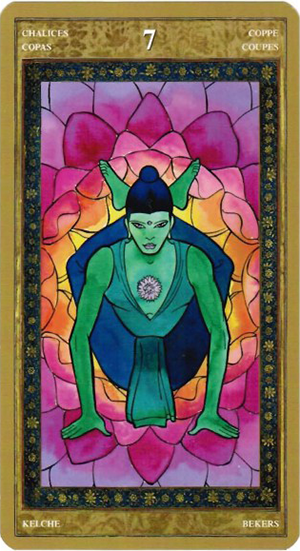 The card used for today’s tarotscope — Seven of Chalices — is part of the Yoga Tarot series, created by Massimiliano Filadoro, and Adriana Farina.